Help! I found a baby raccoon, what should I do ? Raccoons are commonly found living and nesting within city limits. Live trapping, poisoning and pest removal of the mother raccoon contribute a great deal to young orphaned raccoons being submitted to wildlife rehabiltators. Please contact a wildlife rehabilitation group for information BEFORE trapping and relocating any raccoon in the spring/summer of the year. Is the raccoon approximately the size of a medium to large cat, appears bright-eyed, unharmed and semi-aggressive? If YES, the baby raccoon is most likely on it’s own in the wild and does not need human intervention. If NO, and the baby is smaller than a medium-large cat, the raccoon still needs nursing and care from it’s mother. For very small raccoons, attempt to locate the nest (usually in an attic or eaves trough) and try to either place the baby in the nest or nearby in a small open box. Check back every couple hours or so to see if the baby is still there. If the baby has not been fed or attended to for an entire day, then contact a licensed rehabilitator immediately. 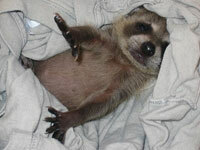 Do not attempt to relocate the baby until you have spoken with a licensed wildlife rehabilitator.